Samajwadi Party chief Akhilesh Yadav said, "The government, guided by the RSS, is trying to distort the tenets of Constitution." 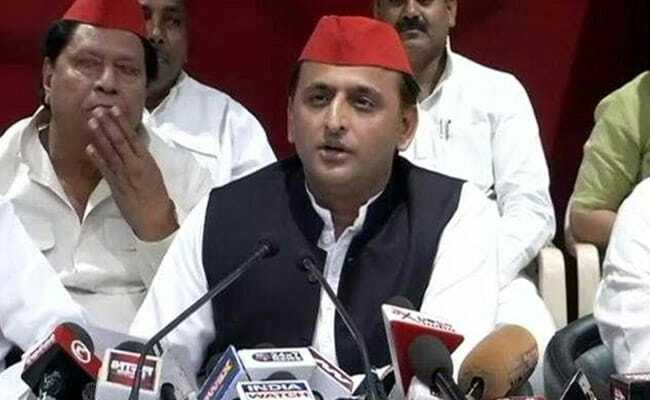 Mumbai: Former Uttar Pradesh Chief Minister and Samajwadi Party chief Akhilesh Yadav today lashed out at the BJP and RSS for "divisive politics", and said if the current government is not ousted, it would be harmful for the country. "First, this government came to power by fooling the masses with a false promise of depositing Rs 15 lakh in everyone's account. And after taking over the reins, it has indulged in divisive politics and is raking up communal issues so that people forget the issues of unemployment, starvation, farmer suicides," he said. "It is trying to create a divide between Hindus and Muslims, between castes. This is harmful, and we know how to deal with it. We will dethrone these people in 2019 and 2022," Mr Yadav said, referring to the next Lok Sabha and Uttar Pradesh Assembly polls, respectively. Referring to the BJP-led Maharashtra government's decision to build a grand memorial of warrior king Shivaji in the Arabian Sea, Mr Yadav said when his party comes back to power in UP, it will create a grand park in Shivaji's name, spread over thousands of acres. The BJP-led governments in both Maharashtra and UP have miserably failed in tackling farmers' issues, and loan waivers are empty assurances, the SP leader said. "I fail to understand why farmers in a financially sound state like Maharashtra are continuing to commit suicide The same trend is now seen in Uttar Pradesh too," Mr Yadav said. Narendra Modi government's demonetisation was a "complete failure", the former UP chief minister said. "GST and demonetisation have been duds. Corruption and black money still prevail. If you (the government) think that it (demonetisation) worked, then I suggest you repeat it once again. Perhaps it will work better this time," he quipped. "When an out-of-order EVM can be repaired, then can it it not be tampered with?" he asked.